I love John 11:43 in the original Greek Text. Before I share why I love it, let’s go back to the beginning of the story. On the south-eastern slope of the Mount of Olives, approximately two miles east of Jerusalem, and on the road to Jericho, sat the little town of Bethany, home of the family Jesus deeply loved…Lazarus and his two sisters Mary and Martha. When Jesus heard that, He did not leave but stayed where He was for two more days. When they neared Bethany, they learned that Lazarus had been buried four days before. Jesus told her, “Your brother will rise again.” Martha thought that Jesus meant Lazarus would rise again in the last day resurrection. As they rolled away the stone, Jesus lifted His eyes and prayed. (Now, we come to the verse I mentioned at the beginning.) Then, as most Bible versions say, Jesus cried out in a loud voice, “Lazarus, come forth!” He yelled out, as it says in the Greek, in a megas voice. When you look up the Greek definitions, Jesus actually yelled, “Lazarus! Here! Outside!” Can’t you just see Jesus pointing His finger at the tomb and then at the ground, stomping His foot, and commanding in great resolution and power for Lazarus to come out and join Him? However, what we fail to realize is that when Jesus stood before all the tombs that day, He had to yell, “Lazarus!” If He had not, every one of the bodies buried there would have come out with him! Jesus loves each one of us just as much as He loved Lazarus. He weeps that death separates us from Him without His salvation. He gives us a Lazarus-call, beckoning us to come out of our darkness into His Light, to remove our grave-clothes and be free, and to see the glory of God. When we hear His call, do we stay in our darkened tomb, wrapped in our stinking death clothes, or do we shed them and come out to join the Light of Life? Do we see God glorified? ***Scripture from NKJV (John 11:1-43) unless otherwise noted. A dusted off rerun from 4/28/10. I love it in the Greek! You know, the very first novel I wrote was about Mary, Martha, and Lazarus. What I loved about writing them, besides the research, was that there is very little known about them beyond Scripture. That allowed me to weave a story from my imagination, as long as I stayed true to what was known and traditions. It was such fun! “When Jesus heard that, He said, ‘This sickness is not unto death, but for the glory of God, that the Son of God may be glorified through it.’” Yet, He did not leave but stayed where He was for two more days. When Jesus saw the tears streaming down her face and heard the cries of the other mourners with her, He “groaned” in His spirit. “Groaned” in Greek usually means to be angry or indignant, or to reprove severely, as violent agitation of mind. But here, it is that inward agitation of grief. He was deeply disturbed at seeing the sorrow of others. Can’t you just see Jesus pointing His finger at the tomb and then at the ground, stomping His foot, and commanding in great resolution and power that Lazarus come out and join Jesus? I love this story. It reminds me of a friend who prayed desperately for her brother to be released from his grave of darkness and come out into the Light. Jesus loves each one of us just as much as He loved Lazarus. He weeps that death separates us from Him without His salvation. 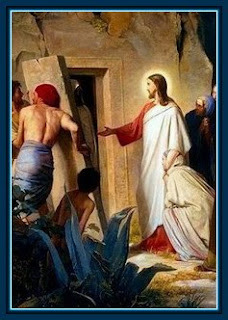 He gives us a Lazarus-call, beckoning us to come out of our darkness into His Light. When we hear His call, do we stay in our darkened tomb, wrapped in our stinking death cloths, or do we shed them and come out to join the Light of Life? Will God be glorified? Praise God and I thank Him for the reminder to join Him the light of life. 1) I’ve wondered if perhaps everyone misunderstood, and he was actually grieved (aggravated, etc.) to the point of weeping because nobody–not even Mary–believed him. 2) “Lazarus” wasn’t that uncommon a name–probably several were buried there. You know when it’s you Jesus is talking to, whether he uses your name or not–and I suspect he did it for the benefit of the onlookers. 3) Recalling that exiting the grave put Lazarus on some people’s “assassinate this guy” lists, I wonder what the rest of his life was like. This story is a moving portrait of the relationship Jesus had with Mary, Martha and Lazarus. I believe we, too, can have such a relationship. An interesting thought, what was the Lazarus’ life like after this? You made the story come alive, Lynn. We all had a Lazarus moment when we passed from death to life–and it’s all because of Jesus. Glory!